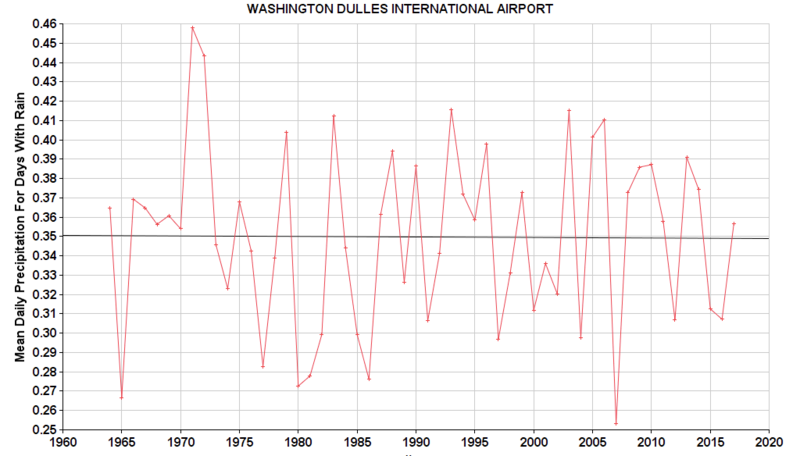 Previously I wrote about the variation In precipitation At Washington Reagan National Airport (DCA) and Baltimore Washington International Airport (BWI) to see if there was a significant change over the years due to Climate Change, and now it’s time to look at Dulles International Airport. 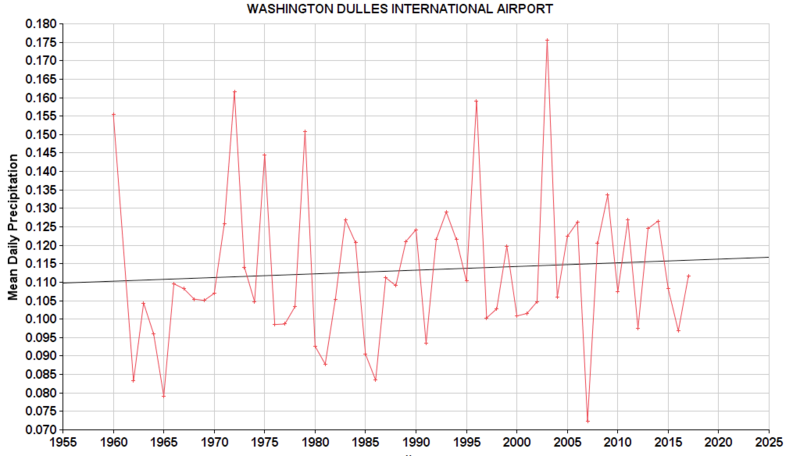 The IAD dataset starts later than that for DCA and BWI, and starts from April 1, 1960. As with the DCA and BWI data, there appear to be a few days with missing data, as for some years there is only data for 364 days. The actual number of days per year of data was taken into account when computing means. Also, large amounts of data are not available for various dates 1960 through 1963, and of course there is no data for the remainder of 2018. So the plots are from 1964 through 2017. Next is a graph of the number of days per year with precipitation, followed by its inverse, the number of days without. The number of days with precipitation has increased from about 114 to 121, or 6 more days. 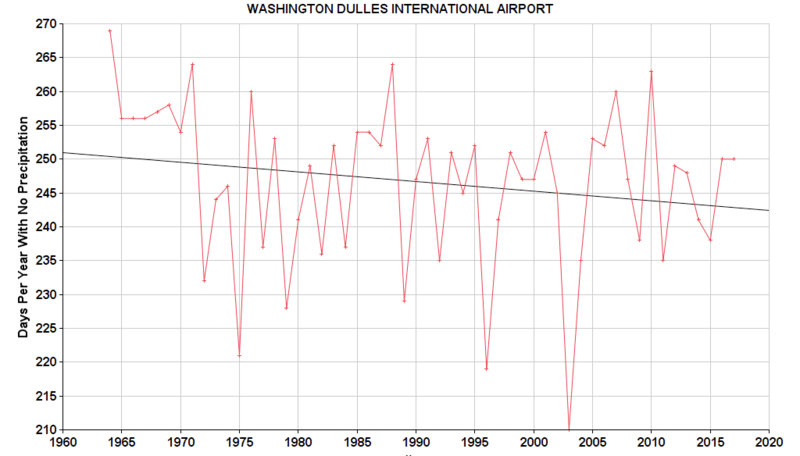 The increases at DCA and BWI were 5 days, and they was over a larger number years. 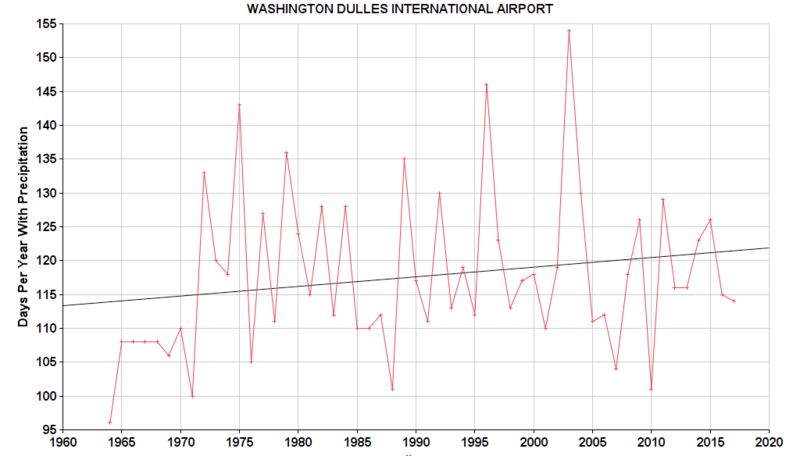 It currently rains about 115 days per year at DCA, and 118 days per year at BWI. This leads to the next graph, the average rainfall on days when it actually rained. There is no apparent change at all – this graph is flat. 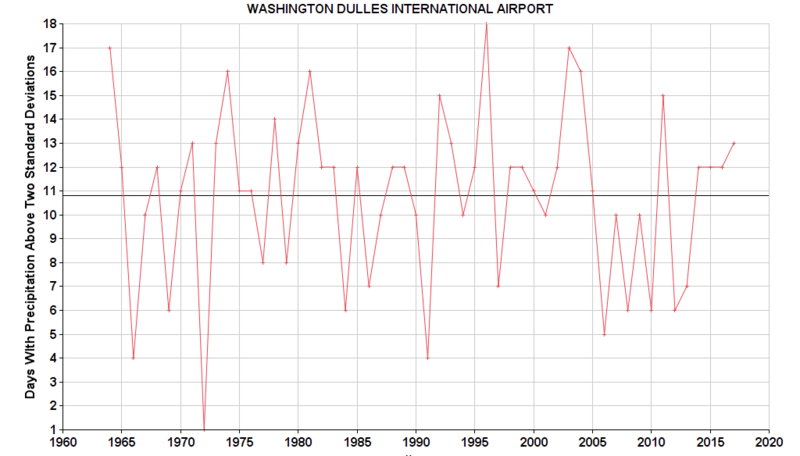 So while it rains about 6 more days a year at IAD, the amount of rain, on days when it does rain, is the same. Actually if you squint, it looks like it might be very so slightly decreasing, but it is subtle. And probably going to be different once you add in another year’s worth of data. Next, we can look at the standard deviation in rainfall amounts on days when it rains, standard deviation is amount of variation of a set of data values around the mean (average). My previous post has a link for more information about standard deviation, as well as the best standard deviation joke for math nerds. The number of days with rain is increasing, 5 or 6 more days per year, over the last half century or more, at all three airports. The average annual measured rainfall is either decreasing (DCA) or increasing (BWI, IAD), depending on which station you look at. The average amount of rain on days when it does rain is either decreasing (DCA), increasing (BWI) or exactly the same (IAD). 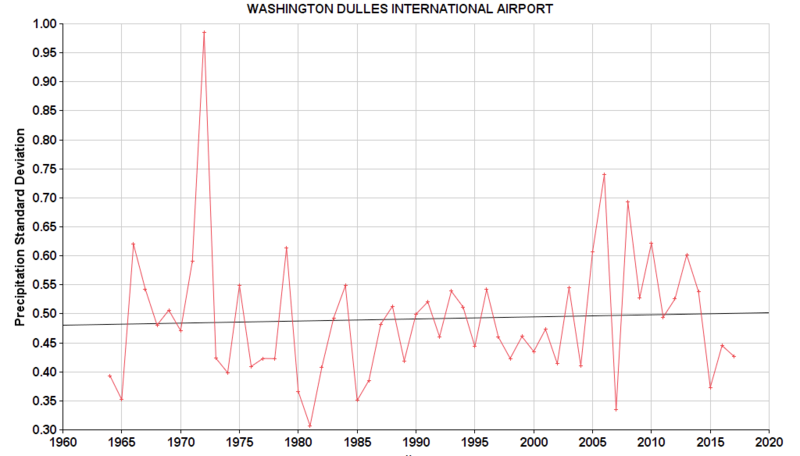 The number of days with significantly high rainfall, exceeding two standard deviations, is either very slightly increasing (BWI) or unchanged (DCA, IAD), depending on which airport you look at.